The 2014 NATO Summit closed on Friday with one main accomplishment: the increased militarization and institutionalization of a new Cold War. The declaration also noted that NATO will form a Rapid Reaction Force in response to Russia’s “escalating and illegal military intervention in Ukraine.” Consisting of 4,000 NATO troops, it will initially deploy to the Baltics this fall. Clearly, NATO does not view such a deployment as a violation of the 1997 NATO-Russia Founding Act, in which NATO had promised not to place combat forces on the territory of new member states. In any event, that deployment will be followed by two weeks of joint NATO-Ukrainian military exercises outside of L’viv in September, followed in short order by bilateral UK-Polish military exercises in October. As Nation contributing editor Stephen F. Cohen has repeatedly warned, what makes this new Cold War even more perilous than the old one is that the dividing line between East and West, rather than running through Berlin, now runs right through the heart of Slavic civilization in Ukraine. The action has moved eastward, all the way to Russia’s doorstep. Does anyone really believe that a 4,000-troop NATO force would be effective in thwarting an offensive by the vastly larger Russian conventional forces? Of course not. NATO’s actual motive behind the formation of the Rapid Reaction Force is to give it a pretext to build much-desired military infrastructure in Poland and the Baltics. It should be noted that, of these countries, only Estonia currently meets NATO’s required 2 percent of GDP defense expenditure. The military buildup on Russia’s borders, coupled with renewed calls for the placement of missile defense sites, is an unprecedented and, given the ongoing crisis in Ukraine, dangerous step. While the new force would be basically worthless in the face of a concerted Russian advance (by some estimates, Russia has amassed between 15,000–20,000 troops on its border with Ukraine), it may well encourage such virulently Russophobic NATO members such as Poland and the Baltic states, as well as NATO “partnership for peace” states like Ukraine and Georgia, to act more provocatively toward Russia than they otherwise might have in the absence of a Rapid Reaction Force. What the stationing of NATO forces on Russia’s borders actually does is institutionalize and militarize this new Cold War. 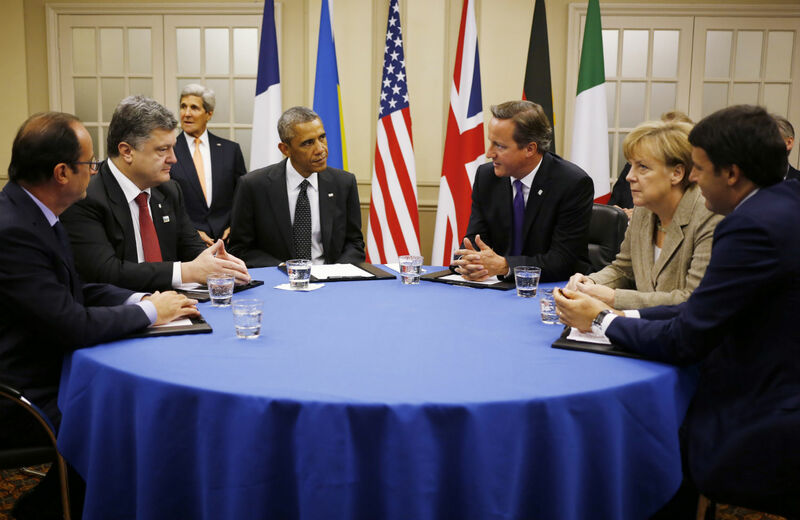 These efforts at “building a stable, peaceful and undivided Europe” will by no means be limited to Ukraine. The declaration states that the Black Sea region also “remains an important component of Euro-Atlantic security” and that NATO will “continue to support, as appropriate, regional efforts by Black Sea littoral states aimed at ensuring security and stability.” If I were them, I’d worry. A quick review of NATO’s track record with regard to “ensuring security and stability” in Libya, Iraq, Afghanistan and Kosovo does not exactly inspire confidence. This is a message to you, oh Vladimir Putin, these are the jets that you have sent to Bashar, we will send them to you, God willing, remember that…. we will liberate Chechnya and the entire Caucasus, God willing…. Your throne has already teetered, it is under threat and will fall when we come to you because Allah is truly on our side. Long ago, Edmund Burke wrote, “The circumstances are what render every civil and political scheme beneficial or noxious to mankind.” It is blindingly obvious that the circumstances in which we find ourselves today—in which a tenuous cease-fire has taken hold between the rebels and Kiev; in which a species of militant Islam poses a significant threat to both Russia and the West; in which large swaths of Ukraine lie in ruin and over a million of its people have fled; in which a new Cold War threatens to upend the arrangements that have given rise to a peaceful, prosperous Europe—most emphatically do not lend themselves to NATO’s plans to further embrace Ukraine at the expense of a confrontation with Russia. But that, sadly, seems to be the direction in which NATO seems intent on heading.